Did you know 40 percent of food produced in the United States is never eaten? The average American household wastes $1,500 on food waste per year. Nashville Mayor, Megan Barry, recruited some help from local restaurant owners to lend a hand with her Food Saver Challenge, which combats the city’s food waste problem. Barlow opened Sloco in 2011 with the vision to basically be a waste free restaurant. Before opening Sloco, he established a full recycling and composting program by working with farmers and waste facilities, and eliminating 95 percent of restaurant waste. Sloco takes no short cuts in being a no-waste facility, even down to the compostable products meals are served on to the reused jars that are used as water glasses. Save those bruised apples! Barlow said the biggest challenge is just a change of habit. “We expect big portions, big plates and don’t want to pay accordingly. If food cost what it should cost, another discussion, the excess would definitely start to fix itself, but for now we have to live the change. On the same note, we need to relish the ugly food. Just because it has a bruise or doesn’t look like the marketing picture doesn’t mean it needs to be tossed,” explained Barlow. 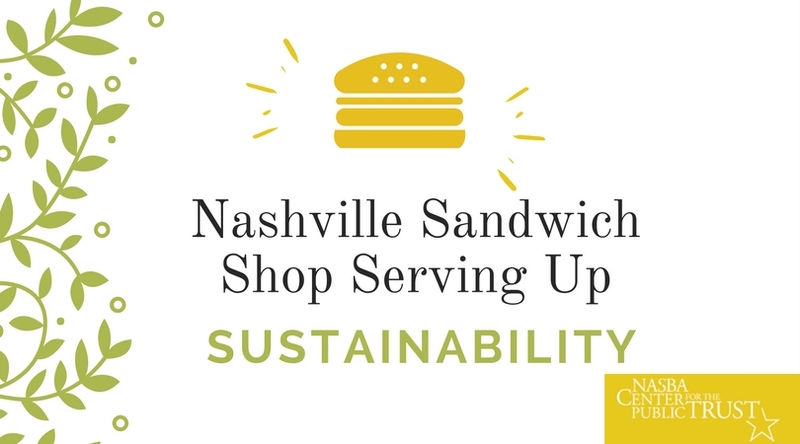 The CPT commends Sloco and their sustainable efforts, inspiring local Nashvillians and restaurant owners. If you have a Good News story, email info@thecpt.org.